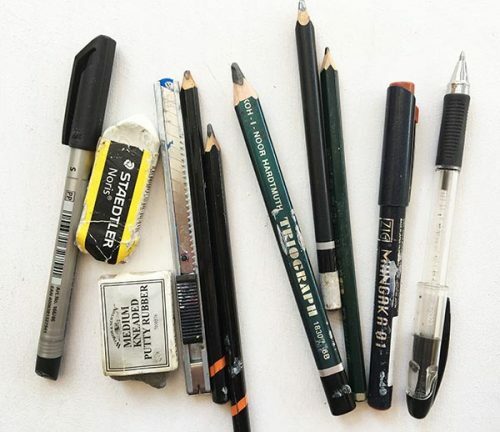 In the previous post I chatted about Caroline Chappell’s method of making working sketches and visual notes. 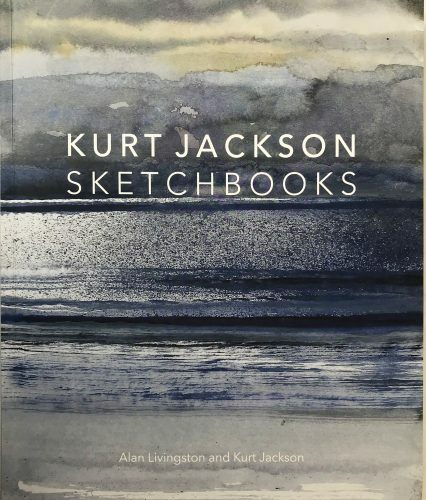 Kurt Jackson’s sketchbooks are an end in themselves and function as independent artworks. Sketching is one of the things that we all believe in but seem to find it really hard to do. I mean, how hard is it to draw for ten minutes a day? And anyway, why would we want to? This is a must-read! I can’t show examples of his work other than the cover of his book – but I’ll give you links… and show some of my own materials. I found Kurt Jackson’s concept of sketching very inspiring and I wonder if I could make myself try some of his methods. I drew every day for three months when I went to Singapore and Australia, (see the next blog post) and since studying Jackson’s methods I can see what might have improved my experience. After reading and studying this gem of a book, I yearn to do more! If you follow this link: Kurt’s Sketches, you can see some of his beautiful drawings. What size are his books? He uses 3-4 different sizes depending on the occasion. They are hardbound or spiral bound, with good quality 160gsm paper. What medium does he use? Whatever is appropriate for the occasion. He uses a huge variety of materials (more about this later). How long does he take to do his sketches? Anything from two minutes to perhaps occasionally 30 minutes. Where does he do his sketches? Everywhere. Walking along the street, in pubs, on the train, at the sea, while visiting friends, at Glastonbury. 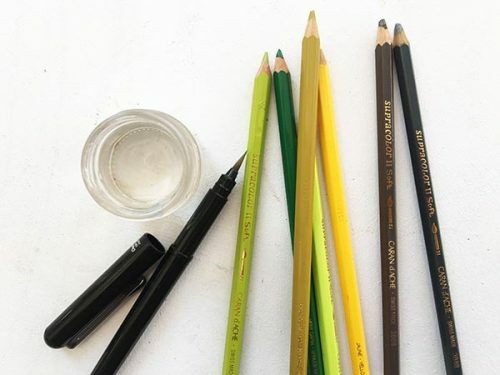 My aqua-coloured pencils, a nylon brush with a lid and a small bottle of water. The brush had a cartridge which I never used, but I dip the brush into water to brush over the aqua pencils. This means I can draw in the car – catching fleeting moments of ploughed fields. How does he use his sketches? Jackson insists that his sketchbooks are one of his artistic expressions and an end in themselves. Sure, some lead to paintings, but they range from visual note-taking and mark-making to full-on artwork, paintings and collages. He will sometimes complete a sketch – adding colour – at home. What about the weather? Kurt paints regardless of howling storms, inclement weather, etc. His Glastonbury paintings had glue mixed into the mud to use it as a medium! He will paint or draw in unbelievably uncomfortable situations. He doesn’t mind and even embraces the fact that the splash of water from the canoe oar affects the water-soluble pencil. But he doesn’t take his sketchbook on the canoe in case they capsize. He draws on loose paper and sticks it in the book later. While his artworks are typically not peopled, his sketchbooks often have studies of people. He draws his family and in particular his wife. He draws all the time: and his wife is so often his model that we almost feel we know her. Caroline doesn’t even have to sit perfectly still – she texts, reads and gets on with things while he draws her. He draws her while they are on the train, or after a meal at the table. He draws the sea and surrounds returning over and over to the same spot such as St Just. He draws on holiday, on the ferry, the train, while walking along, after a pub meal. He is an ecologist and geographer (he studied zoology at Oxford University) and he is very interested in terrain and weather. He is a member of Greenpeace and the places he depicts are also studies of weather and land. He can name all kinds of creatures, insects and plants which appear in his drawings, such as Pyrus Cordata – Wild Truro Pear! Kurt loves nature and you’ll find a very meticulously drawn study of, say a fish or a shrew or some Emperor moths. He has been Resident Artist at Glastonbury Music Festival and his sketches were auctioned for charity. His work has raised over £250,000. What are his stylistic characteristics /peculiarities? He incorporates a comment and / or location and date in all his work in such a way that it is a part of the final piece. It’s just written in his own handwriting with whatever instrument is handy, so it’s not an affectation. This has also fed into some of his artworks. 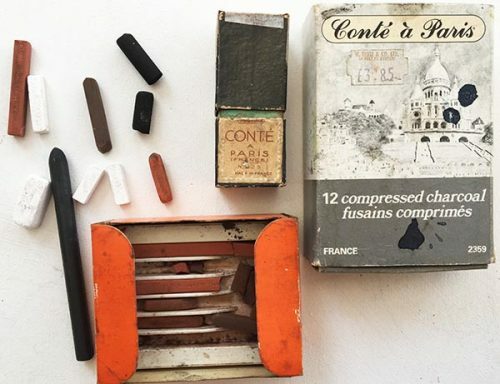 My conte and charcoal, as well as a stick of graphite. He often incorporates some collage of a found piece of paper or draws on a piece of newspaper – not any old piece for decorative qualities but something that will add meaning as well as visual drama or structure to his drawing. This could be a bit of a menu, newspaper date, bus ticket etc. His work is usually textured by various means from physical (mud of sand) to visual (sprayed area or blots of ink). He uses many different materials and will visit the beach with his watercolours, charcoal and oil pastels and incorporate them all. I imagine that he feels released from archival considerations because they are personal artwork and by nature ‘Sketches’. There are a few photos of him doing battle against the elements while painting on an A0 sized sheet of paper or canvas, held down by stones, on the beach. His work is always carefully considered (within the challenges of time and place). My travel set of watercolours. I bought an empty tin and empty pans then filled them with my favourite Artist quality tube colours. I would imagine that on each outing he plans the way a mother plans meals for a baby. In fact his luggage can’t be more complicated than that of a mother! 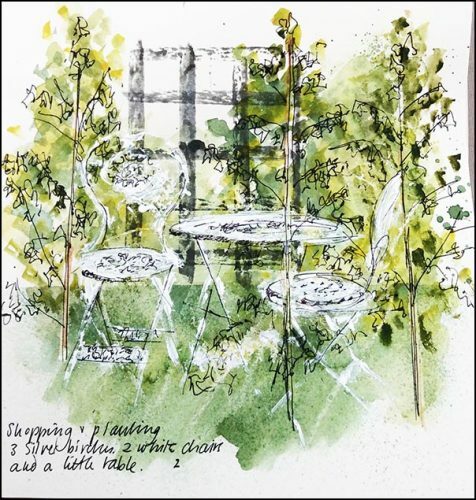 He obviously plans what to take and selects his colours carefully – you are aware of his ‘limited palette’ Every now and again he is caught out wishing he had another means to draw, but mostly he has what he needs available. crayon (I’d imagine these are like oil pastels – they are very good quality). Maybe they are soft wax made like a pencil. I think he writes with these quite often. 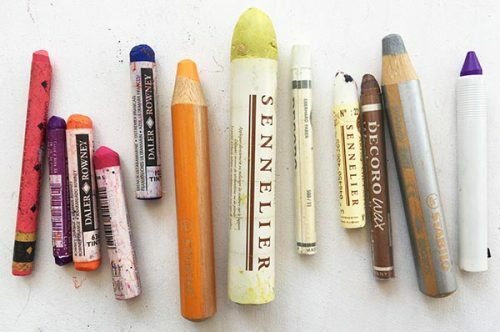 My oil pastels and crayons: I’d actually ‘file’ these under wet materials, not dry materials, since they are used in conjunction with watercolour (under or over); and acrylics to add comments or marks. I’d imagine he’d use a tear off palette or prepare a small wet-palette from a Tupperware container. Toothbrush and lid for fine spatterwork. If he is stuck he will improvise and draw with, say ink and a feather or a stick, or make his own charcoal. What can I take home from this? I would not have dreamt of taking acrylic on a picnic! It dries so fast. But I am reviewing this bias; and there are wet-palettes. 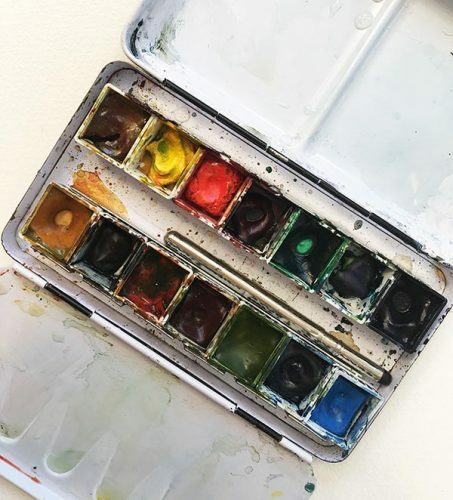 (Try this link to you-tube on how to make a wet palette) I think that acrylic makes a real difference – you don’t have to get scared you are overworking a watercolour and you can add white on top not trying to keep the precious white paper. Also the colour is much stronger. Watercolour can be very wishy-washy. But what I think I have learnt from seeing his work is that I was far too precious about my sketchbook. I used loose paper, cut and folded to bind later, in case I messed up. He has a variety of books which he gradually fills. If he messes up he can tear pages out or glue pages together. He adds bits of collage – often a word or date relevant to the sketch. I thought that each sketch must be lovely – but I can see the value of using sketching as one would think aloud, doodle, explore. Explore the subject and the medium. Loosen up. Get real. My first acrylic sketch after reading this book. How nice to be able to do the white bits afterwards. And then to add some gel-pen to show it up. The more you draw from life as opposed to drawing from photos, the more you learn how to read Nature and then you can improvise on the canvas and work more intuitively. I thought that one ought to sketch before painting to study the subject (not that I do) – but he sketches for the sake of sketching. The best thing is that he doesn’t need a camera. Cameras dull colours and flatten space, and we start getting addicted to the sort of reality a camera gives. They are still useful, but as an extra not as the only record. In my next blog I am going to show you some of my favourite sketches I did while in Singapore and Australia. The we can look at this blog again in a year’s time and see if I have done any sketching and if I have made it part of my working schedule. Oh, and check to see if I have improved. Thank you Jenny. It could take you into exciting calligraphy realms! I am so thankful that we have the priviledge of looking at artists work through your eyes! Thank you Heleen – he is so inspiring that I just wanted to share the experience.